The “Conseil d’Unité” is an advisory council, which determines the laboratory’s scientific policy and endorses the rules on allocating common funds depending on needs and activity. It also approves job definitions and the annual allocation of human resources. Its members, some elected, others appointed, meet at least four times a year. 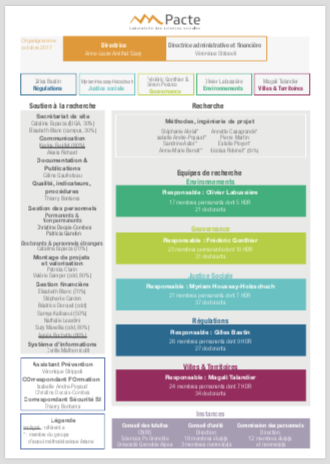 Download the Pacte organization chart. The 2017 presidential election in France: towards a new partisan system?